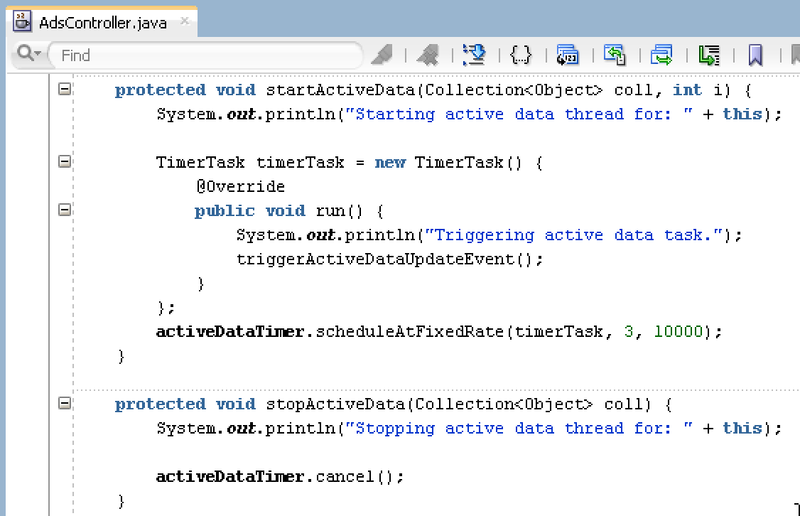 Active Data Service in ADF is very useful functionality, it allows to push data to the UI, without extra refresh/reload. However, due to its complexity, is not used too often. My goal is to provide as much as possible simple example for ADS use case in this post. In the future posts, I plan to post updated samples with more complex use case implementations. As you can see above - thread to push ADS changes is created in start method, automatically when ADS gets initialised after post construct method. Thread is stopped automatically, when ADS is deactivated (this happens when browser is closed or navigated to other page). 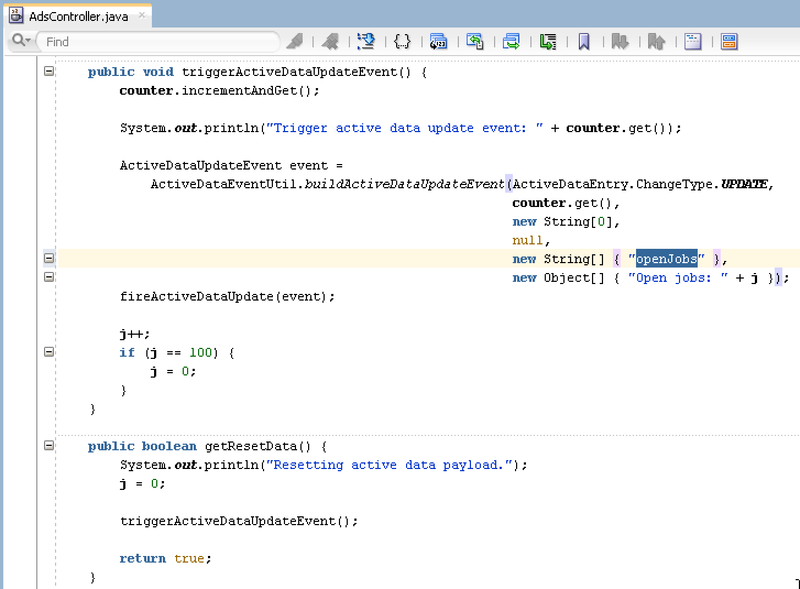 I am trying to extend the application and adding code to get BindingContext in AdsController triggerActiveDataUpdateEvent method. But BindingContext.getCurrent() is returning null. Can you please suggest what could me the issue. Currently i am only displaying the counter on jspx page with page definition file. The code itself is working fine. I'm not sure if this would work with ADS, this was the reason in my sample app not to use Binding Context directly. 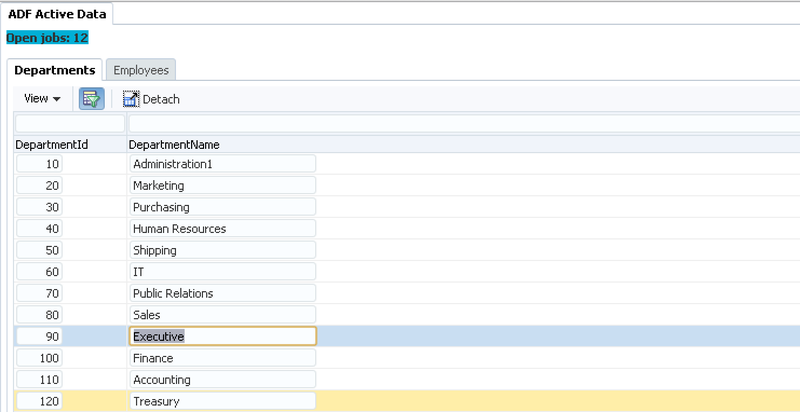 What if i will need to do an executeQuery from the BindingContext or do something that is specified in the bindings ? I don't think this is supported, this is why I was not using it directly in this sample - but publishing data from Model through push. 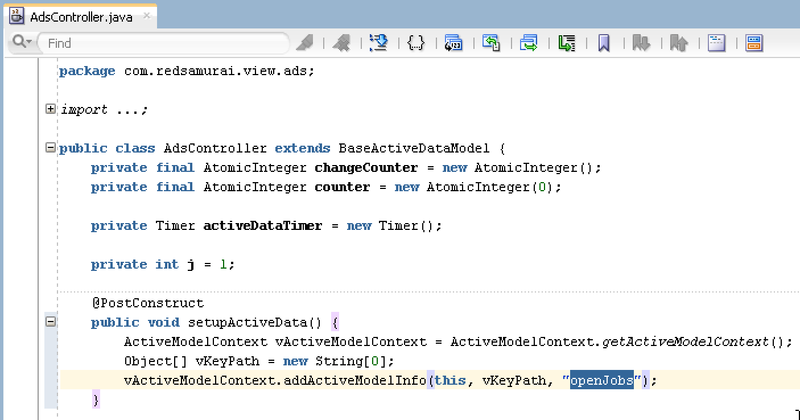 I have a workaround to access the bindingcontext whenever ADF push happens. Steps are given below. I follow the same for my requirement. Correct me if the approach is wrong. 1. AdsControllerBean is registered at session scope, thus retains value across the request. We should keep a boolean variable (say dueTOADSPush) with public setter/getter exposed. 4. Whenever ADS push happens, in addition to calling 'fireActiveDataUpdate', set this boolean value to true. 1. ADS push happens and we set 'dueTOADSPush' flag to true. 3. Getter method mapped to OutputText component fires. Thanks for update, this could be useful for readers. I would need to test this approach. 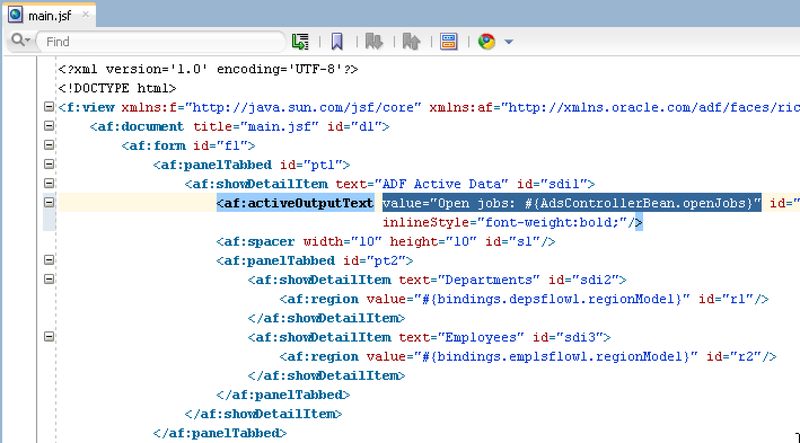 One more info from what I experienced while working with ADS particularly with af:ActiveOutputText component. If we keep the code, that sets up the active model info, inside post construct method, application looses ADS connection whenever full submission (or at least F5 refresh for sure) happens. As a result, after page full refresh, ADS will stop working. You can confirm this using chrome/firebox debugger console by checking the connection state of ads. Instead of postConstruct, if we keep the code inside the getter (i.e. getOpenJobs in this sample), it works fine all the time. af:Table component doesn't contain this issue. Thanks, your comments are very useful ! I am also using ADS in my project and have hit a roadblock. For my project I am trying to update the table directly when the table in updated in the database. I receive the DatabaseChangeEvent from the OracleDB but don't know where to get new row data from, to pass to buildActiveDataUpdateEvent method (image11 above). Do I need to? Any suggestions? Hi I am facing some issue while using Active Data Service on active output text. The page is showing as always loading, though nothing is being loaded. I am setting the context in getter method. Can anyone give a solution to this issue? I am not able to download sample application[LongRunningTaskPushApp.zip].